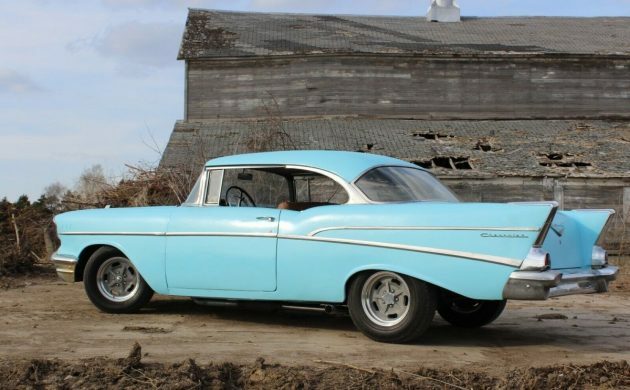 Take a 1957 Chevrolet 210, clean up the outside a bit, install a custom interior and drop an LS V8 under the hood and you have what could be the ultimate sleeper! Looking at the outside of this Chevy, you would never know that it’s packing a 5.3 liter V8 with modern fuel injection, power brakes, power steering and everything else you need to safely go fast in it. 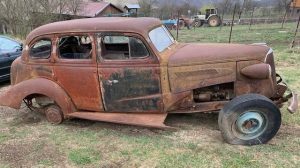 It just looks like a tired old car with some period style custom rims. And that’s why this car is the perfect definition of a sleeper! You can take a closer look at this awesome build here on eBay in Papillion, Nebraska with a current bid just under $20k. This 5.3 liter Vortec V8 looks a bit out of place in the engine bay. It appears to be wearing the engine shrouds from an early 2000’s Cadillac Escalade and has been painted to match the car. I’m not sure if I like that touch or not, but overall, the swap appears to have been done very nicely. The intake looks a bit close to the radiator support, but hopefully, that’s just the angle of the photo. This engine is not only more powerful but will be more reliable and more fuel efficient. 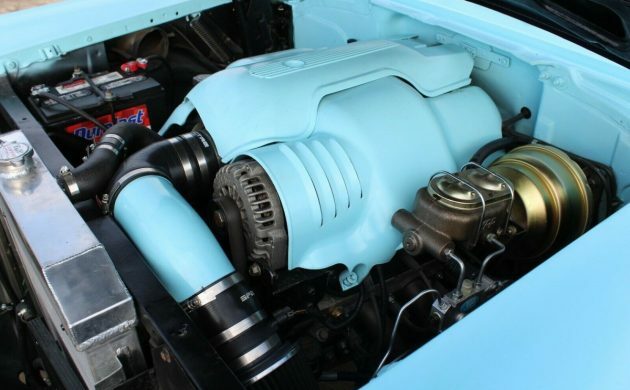 Obviously, power output is the most important aspect of a build like this, but having engine diagnostics and the knowledge that it will start easily year around are definite pluses! A build like this wouldn’t be complete without a nice interior and this one turned out beautifully. The original dash, trim and seat frames have been retained but updated. It appears that they even managed to connect the 4L60 transmission to the original column mounted gear selector. That’s a nice touch that hides the fact that there’s something special under the hood. They could have cut corners and installed a universal floor shifter, but that would have looked out of place in this interior. One glance at the inside and you know this car isn’t exactly stock, but you might just assume it’s packing an old 350 V8. There are lots of neat touches with this car that make it really interesting to study. LS swaps always fascinate me, but especially ones that the builder took the time to conceal the fact that it has a modern powerplant. This Chevy should prove to be a blast to drive and is ready to hit the street. So, is there anything you’d change or would you enjoy it as is? One of my bucket list cars. Beautiful shape compared to what came a year later. This is what I would drive in my east to west trip. Ouch!! I guess it’s my opinion Dickie but the 58 Chevy was a one year body style and was a beautiful car!! There was a white one in American Graffiti and that car and the yellow Ford hot rod that Milner raced at the end of the movie were the real stars of the movie!! 57’s are awesome but the 58 was a great car too!!! Yes they were available in all the tri five years. 1957 probably had the highest production number. Yes it was. I had one just like this one. Well except for the 6/stick that was in mine. Thanks for enlightening me guys; that is a detail I was completely unaware of . Proves we never get too old to learn something new about old ! I would have lost a $20 on this bet. I didn’t know there was such a thing as a 210 HT. I love it, but hardly a sleeper, much less the ultimate sleeper! Are 60 year-old anythings sleepers any more? This may have been a sleeper in 1976. Today, everyone will look your way just because it’s not a 20xx RAV4 bar of soap. A sleeper would be a 20xx RAV4 with wheel covers running 10s in the quarter. Exactly. Old Car = Hot Rod, whether true or not. Great car, BTW, though my favorite 57’s are all-black with the least chrome possible. This one still looks very clean without being overdone, none of that fuzzy dice, Betty Boop, chromed-everything look so many Tri-Fives suffer. A real nice build by someone with foresight and tallent. Totally agree David. When I started reading this “ultimate sleeper blah blah blah….” I was expecting it to have a 1200hp twin turbo LS in it. There’s nothing ultimate sleeper about a tri-5 with an LS in it. Seems like 50% of them have that anyways, and that percentage is going up daily. I’m more surprised when I see a stock power plant in one. Very nice 57. 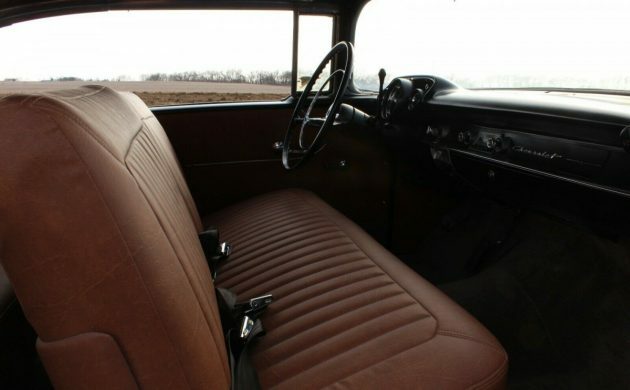 Like that the bench seat was kept and also the column shift. 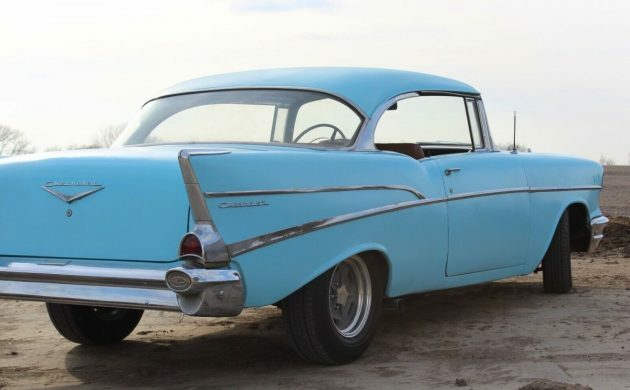 Not 100% sure but I think the 210 HT windshield and rear window were a little taller than the BelAir. Anyone know for sure? Ya, the one in American Graffiti was the first-year Impala. Ron shoulda’ve kept it. Ray Everham has it now. 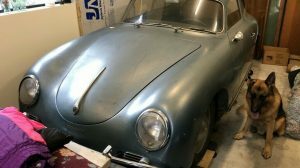 Comment on the “ugly” ’58s. First one I ever got into was a light blue with darker blue interior two door hard top with the big 348, 4 on the floor and positraction rear. Made a comment earlier on the fried Jag 120 I never forgot… never forgot the first ride in the ’58 Chevy either. It got better looking every time we broke 120 on the road… Speaking of ’57s… how ’bout that beautiful orange drag car on Street Outlaws? you can say what you want about 58 impalas but the car that i love is the 58 pontiac bonneville 2 door hardtop! I think you don’t quite understand the term “sleeper”. Not only does a sleeper have more under the hood than one predicts, but it looks like a Grandma car or a basic POS. 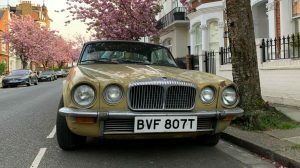 This car can not be called a sleeper. Everyone is going to expect it to be fast just from looking at it. Cool car, as are thousands of other cars advertised for sale. 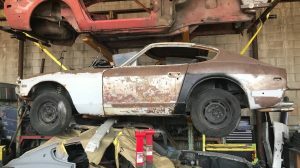 What does this have to do with barn finds? This car makes me drool, and slobber with envy! WOW this is one hot car! Congratulations to the builder. Nice job. Sounds like a good deal. But that is not a 210! Could be . I have a 210 hr. Numbers to show it. The only thing, I would do to this car, is change the name on the title,from who bought it, to mine! Sold for 21k ,what a buy. I built this car.Yes this is a 210 Model…The most rare 1957 Chevy that was ever built.